A friend of mine who goes by name "CS" sent me this screen shot of a particular Washington Mutual (WM) Alt-A mortgage pool known as WMALT 2007-0C1. Let's take a look to see what we can see. Click on chart for sharper image. You might want to open it up in a new window to follow along with the discussion below. The chart shows performance by month since July, 2007. 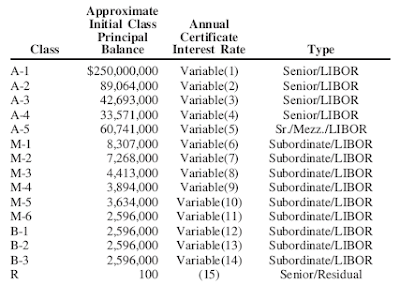 Rows 2-6 are delinquencies through REO (Real Estate Owned). In theory, this should work like an assembly line: Mortgages enter 30 days delinquent, the next month that subset goes into 60 days, then 90 days, then foreclosure, then REO. It's a process that takes time. Look at this most recent jump from December, 2007 to January, 2008. Foreclosures increased a whopping 4.92%, yet in December, 2007 the 90 days delinquent bucket was only 3.79% (If every 90 day delinquent loan went to foreclosure, the jump would only have been 3.79%) How could this happen? The evidence suggests that people are walking away 30 days or 60 days delinquent without even waiting for foreclosure. Note the credit score line. The FICO score for this mortgage pool is 705. Those interested in what makes up a FICO score can find out at myFICO. Bankrate.Com notes offers diverse opinions on what a good FICO score is. While 705 is not sterling, it's not exactly swiss cheese either. Yet in a mere six months (since July), in spite of reasonable FICO scores, foreclosures have gone from 0% to a whopping 13.17% of the entire pool. Has the FICO model gone haywire or is something else happening (such as walking away). Most likely it is a combination of both. This is a relatively new pool. The issue date was a May, 2007. Common wisdom suggests that it is mortgage vintages from 2004-2006 from those buying near the real estate peak that are most in trouble. This pool is blowing sky high in 8 months flat. Inquiring minds may be asking about lines 7 and 8 as well as the GEO lines at the bottom of the screen shot. Line 8 is the sum of lines 4 through 6 (anything 90 days late or greater plus all previous foreclosures and REOs). The GEO lines (geographic distribution) show this pool is 48% California and 14% Florida. 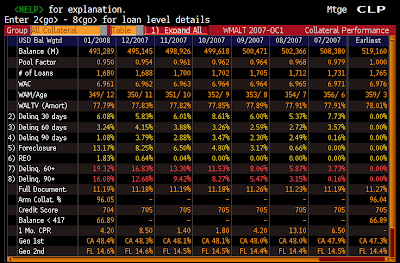 WMALT 2007-OC1 A1 is a securitized mortgage-backed security issued in May, 2007. Following are the breakdowns and ratings from the prospectus. The total pool size is $513,969,100. 92.6% of this cesspool was rated AAA. Yet 15% of the whole pool is in foreclosure or REO after a mere 8 months! In addition, the data suggests that people are not even bothering to wait for delinquencies to hit 90 days. Instead they are handing over the keys right now. Washington Mutual was the underwriter. If you bought a slice of this cesspool from WaMu, are you going to buy their next offering? 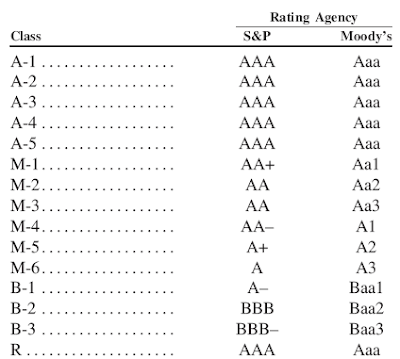 One final question: Does anyone have any reason to trust any rating from Moody's, Fitch, and the S&P?